Dice the green onions using the white portion and some of the green portion. Also, chop the raw baby spinach. Mix the filling ingredients together in a bowl, cover and put in the fridge to chill. Boil a pot of liberally salted water. Once the pot is boiling, cook 4 noodles at a time until they are nearly cooked through. Slightly under-cooking the noodles will help with the assembly. Remove noodles and let them try on a towel. Repeat step 5 & 6 until all the noodles are ready. While the noodles are still warm, spread about 4 tbsp of filling onto each one covering it all the way to the edges. 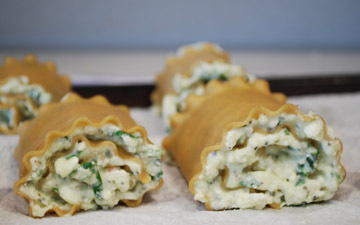 Then, loosely roll the noodle to avoid too much cheese from squeezing out the sides. Place the rolls on a sheet of wax paper seam side down. Repeat and work quickly until all the noodles are rolled with filling. Spray a baking dish (approx a 9"x 9") with cooking spray and spread some marinara on the bottom of the dish. 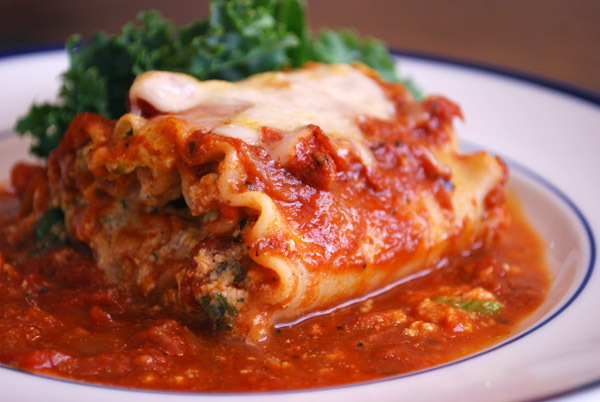 Place the lasagna rolls seam side down into the baking dish and top them with the desired amount of sauce. Top each saucy roll with half a slice of Provolone cheese or any other cheese of your choice. Cover the dish tightly with foil and bake at 350° for 20 minuets..
After 20 minuets, remove the foil, turn up oven to 400° and cook until cheese is bubbly and golden brown. Remove and let cool before serving. This recipe has been contributed by Leo Coulourides, Our Culinary Specialist.